Links in this post are affiliate links. If you make a purchase using these links, I do earn a small commission. Thanks in advance if you use my links. 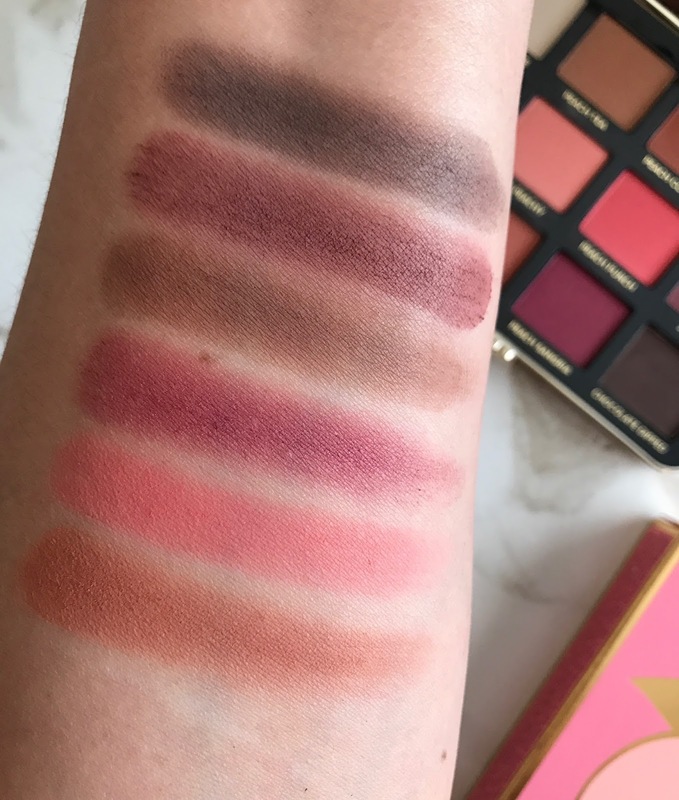 I have to admit that from the moment I first saw the Too Faced Just Peachy Matte palettes on IG a few months ago, I was a little bit smitten. First of all, I own none of the Too Faced matte palettes or none of the smaller 9-pan palettes. Then there was the color scheme - with it's peaches and berries it really looked like a color combo that I would enjoy. 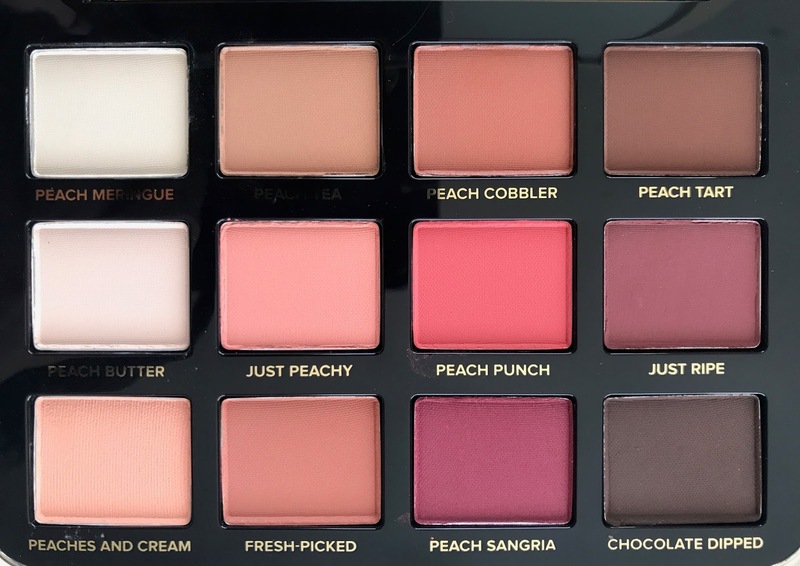 While I know that a lot of people want to move on from the whole "peach" thing, I don't own many peach shades, even though I do have the Sweet Peach palette. But honestly that one doesn't have a whole lot of peach in it, does it? In person I have to say that this palette is even prettier than all of the photos I had seen of it online. These shades are just so stinking pretty, you have some really beautiful peaches, two plum/wine shades, a few browns and two light shades. It's definitely an all-inclusive palette with which you can create many looks without having to go into a second palette. Aren't these shades just beautiful? My favorites so far have to be: Peach Tea, Peach Cobbler, Peach Punch and Just Ripe. Now let's check out the packaging because Too Faced really did a beautiful job putting the Just Peachy Mattes palette together. Unlike the Too Faced Sweet Peach Glow Highlighting palette which I ordered twice and received broken both times (that had really cheap packaging), this palette is made really well. The construction feels really solid and there is not a piece that feels like it's going to fall apart like the Sweet Peach one did. Plus it's adorable, and I am not even one who usually likes cutesy stuff. I tolerate the chocolate bars but feel they are a tad tacky, while the Too Faced Just Peachy Mattes feels more line an antique clutch to me and looks super cute. But what about the formula? We all know that Too Faced has been pretty hit or miss lately and because of that I wasn't expecting to be super happy with the formula. Fortunately, this palette is much better than I had hoped. The formula of the shadows is not dry, it's easy to blend and while not all of the shades are super pigmented, they are buildable. Let's check out the swatches. The first half of the palette contains the lighter shades and I have to say this entire side is beautiful. Well I don't think it was necessary to have both of the light shades, at least they both are decently pigmented. 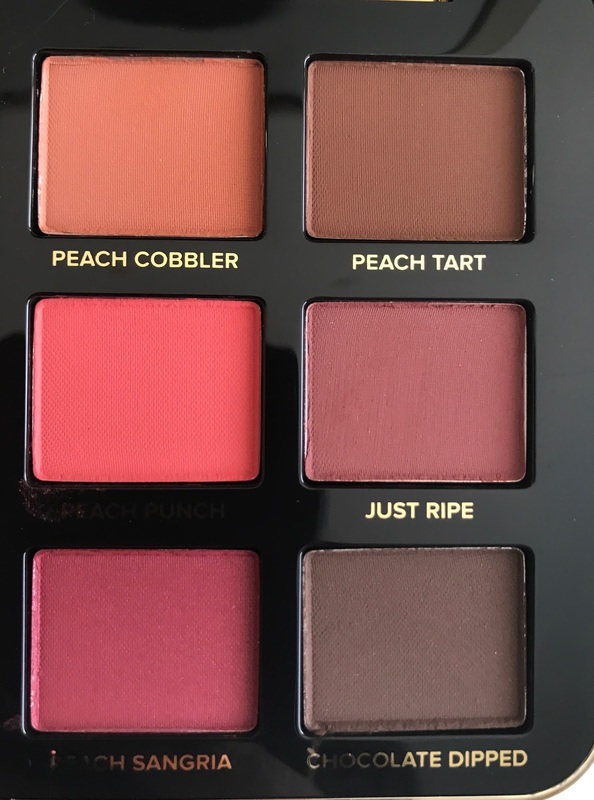 The other four shades are some of my favorites in this palette because they are the beautiful peaches and not everyday palette shades. Peach Tea makes a great transmission shade and Just Peachy and Fresh-Picked are both so pretty! 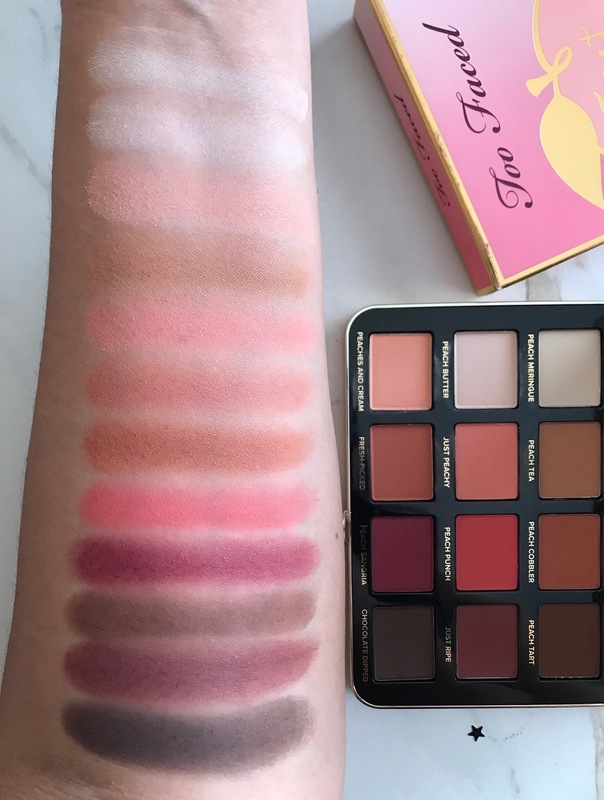 That entire second column is gorgeous and I think these peachier shades are the ones that make this palette stand out from everything else that is out there right now. The second part of the palette contains two more of those awesome peachy shades, two plum/wine tones and two browns. Peach Cobbler and Peach Punch are both just gorgeous and super pigmented, you can see on the swatches just how soft and evenly they swatched. Meanwhile the deeper shades struggled a bit in the swatches. 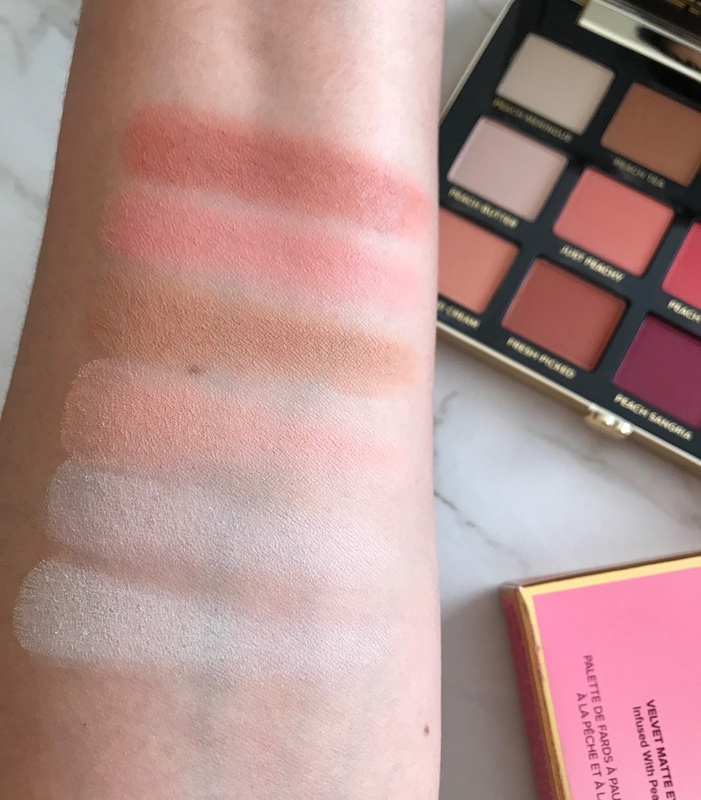 First of all Peach Sangria swatches a bit patchy and then the other shades just don't seem to have that same soft formula as they peachier shades, but on the eyes they do perform much better. Overall, I found that this palette really is very nice. While some shades swatched so-so, they all perform and blend really nicely. They are not super pigmented on application, with the exception of Peach Punch, so you will have to build. But they are so easy to work with and I have gotten zero fall out, and those are the aspects of an eyeshadow palette that are more important to me. I usually can't wear mattes on my lids because they are dry and crapey but I find that these mattes are not drying at all and don't make my lids look older than they are at all. The cost of the Too Faced Just Peachy Mattes is a bit high at $45 and it's a Sephora Exclusive. For 9-shadows the price could be lower, but you can always wait for the Sephora VIB sale to get a discount. If you don't own a ton of matte shades or these shades in particular, I do think this palette is worth picking up. I love to read you blog. So much informative! 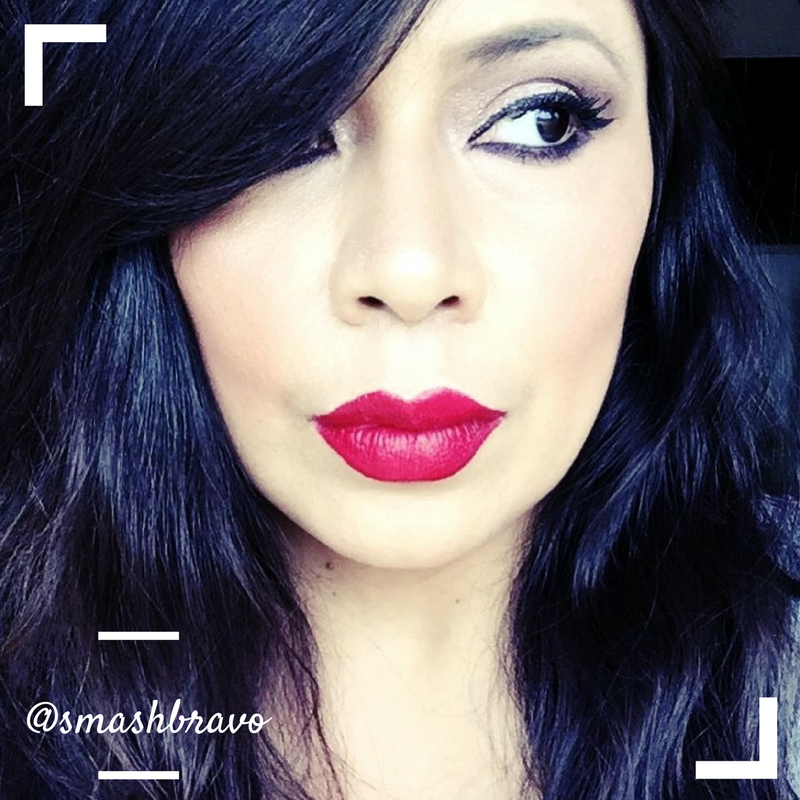 I did flawless make-up lesson by Lina. You can check her site. She is really talented, helpful and caring towards her students. I learnt a lot from her.